When you look at lists of the best minor league baseball stadiums in America you will see many parks built in the 1990s and later into the first part of the 21st century. But you will also find a remarkable park built in 1951, FirstEnergy Stadium in Reading, PA, which has managed to capture the best essence of sport and entertainment. It is the oldest park in minor league baseball's Eastern League. Built originally as Reading Municipal-Memorial Stadium in 1951 it was first home to a AA team in 1952. Since 1967 it has been home to an affiliate of the Philadelphia Phillies. Known as the Reading Phillies from 1967 to 2012, the Fightin Phils are what the team is known as now. Announcers will refer to the Fightins as another name option. The stadium is located 50 miles from their AAA sister in Allentown (Lehigh Valley IronPigs) and 60 miles from the big league team in Philadelphia. In recent years the team has used the slogan "Baseballtown" to refer to the stadium atmosphere. It is a perfect name, as the entire site feels perfect for America's pastime. 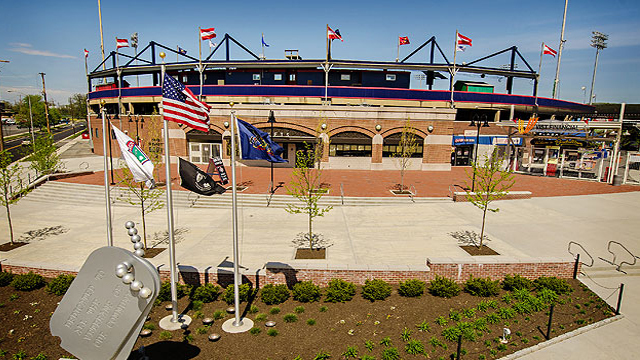 FirstEnergy Stadium is one of the finest and best parks you will find when traveling around the minor league landscape. The food at FirstEnergy Stadium is reminiscent of a local carnival, or maybe a state fair. The entrance plaza feels less like you are entering a baseball stadium, but attending the opening night of a local festival. Many stands such as the Grand Slam Grille and numerous temporary food stands sell many varieties of food. The Long Strike and Bunbino's Tailgate are just a few of the other options around the stadium. Prices are reasonable for all food items. The Yuengling Hometown Tap Room is a good bar built into the stadium. Many people who attend games are part of groups or have paid for the extra option of attending a buffet in various parts of the ballpark. As soon as you come into the main entrance to the stadium you feel like you are in for a party. The team and stadium staff makes every game a true event. This is the place to be in the Reading area night after night. The kids' Phunland area has games and activities to keep the young ones busy all night. There are many cool areas around the stadium such as the Pool Park in right, the 67 Club by third base, the Deck in left, the Foul Porch, and the Launch DM Pub in center field. Most of these are ticket only, although there are parts of the deck and outfield area that any attendee can wander to. The team has an assortment of mascots. Bucky, Changeup, Screwball, Blooper, and Quack are often seen wandering the stands. You may also see other interesting characters such as Disco Brisco and his wacky dancing, as well as the dancing grounds crew. The entertainment never goes out in Reading. The game is never ignored either. The variety of stands and grandstands around the field makes it easy to engage in the game. It is an older stadium so expect to not be able to see the action from the concourse area. Frankly, the only thing keeping FirstEnergy Stadium from getting a perfect or near-perfect rating is the neighborhood. The area around the stadium is generally industrial with very little in terms of pre or postgame amenities. Wandering downtown Reading is not really recommended. The downtown neighborhood is not the greatest. Jimmy Kramer's Peanut Bar and the Ugly Oyster Bar are a couple of great bars in that area. It is also fun to stay at the historic Abraham Lincoln Hotel, which is where famous bandleader John Philip Sousa died. The Reading Public Museum and the Reading Pagoda are the city's signature attractions. Located on Mount Penn, just five minutes east of downtown, the Pagoda is a landmark building worth checking out. A few miles away, at the local airport, the Mid-Atlantic Air Museum is also worth a visit. Wander over to West Reading and check out the Chatty Monks Brewing Company (610 Penn Ave, West Reading, PA). They offer some great local brews and delicious food options in a small friendly environment. It is just down the street from the VF Outlet Mall. The fans that sit right behind the plate are knowledgeable. Once you get out to the fringe parts of the park you may see the more casual fan. FirstEnergy Stadium seems to make both types of fans feel right at home. Disco Brisco can be seen trying to engage the fans with his dancing. I am not sure what to make of him. The various mascots also do a good job of engaging fans. Reading is a pretty centrally located city. It is near to I-78, I-176, and I-76 and not too far from Philadelphia. Other major routes are Route 61 or US-222. Getting to the park can be a bit confusing with all the similarly named routes. There is plenty of free parking around the stadium as a local factory allows their lots to be used on weeknights and weekends. The area gets busy before the game so plans a bit ahead. Tickets are fairly cheap. $7 will get you in with a general admission ticket, but it is only $9 to $11 for reserved options. $14 and $25 buffet options are available. One is an add-on and the other is all-inclusive. The Pool Park in right, the 67 Club by third base, the Deck in left, the Foul Porch, and the Launch DM Pub are all used in some variety for group tickets and private functions. The entrance plaza alone is worth seeing just to feel like an event is happening. I have never seen a plaza or entrance to a sports facility with the feel of this arena. The free concert stage is used pre and postgame, as well as often during the game. If attending with a family where not everyone wants to watch a full baseball game, this area gives another option to your group. Phunland is another option to keep the kids busy during the game. The team offers free programs upon entering the stadium. The stadium concourses display the various history of both the park and the franchise. Wander a bit down there and soak up the history. FirstEnergy Stadium is one of the best places to watch baseball in the nation. It offers a great place to watch baseball, as well offering a bevy of entertainment options for the entire family.